Hosa Technology, provider of analog and digital connectivity solutions for the modern musician and audio/video professional, has introduced the Hosa High Speed Micro HDMI Cables. Certified to carry an HD signal up to 1080p and beyond, the new Hosa High Speed Micro HDMI Cables are ideal for use with portable video cameras and electronic tablets. Featuring HDMI to Micro HDMI connectivity, the new Hosa High Speed Micro HDMI Cables are designed to interconnect devices with Micro HDMI outputs to devices with HDMI inputs. The cables are perfect for playing back recorded footage from portable digital devices such as the GoPro video cameras, as well as many other video cameras and electronic tablets. 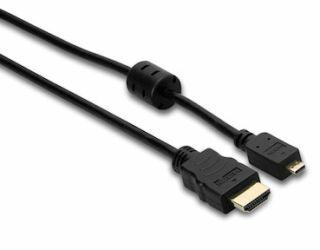 Among their many features, the Hosa High Speed Micro HDMI Cables are ideal for 720p / 1080i signals that are capable of increased refresh rates (above 60 Hz) or Deep Color. Fully backward compatible with all Standard HDMI interfaces, Hosa’s High Speed Micro HDMI Cables support the maximum single-link bandwidth of 340 MHz (10.2 Gbps) and fully support uncompressed 7.1 digital audio up to 192 kHz. To ensure years of dependable service, the Hosa High Speed Micro HDMI Cables feature gold-plated plugs for corrosion resistance and superior signal transfer. Jose Gonzalez, Hosa Technology’s product manager, commented on the company’s new High Speed Micro HDMI Cables: “HDMI has given consumers the ability to eliminate a significant amount of cable clutter in entertainment systems. HDMI is, without question, the best audio and video signal transmission method to get high definition video and surround sound from one’s source device, such as a Blu-ray disc player, to the screen and loudspeakers.